Dang it! Missed Anthony Bourdain! 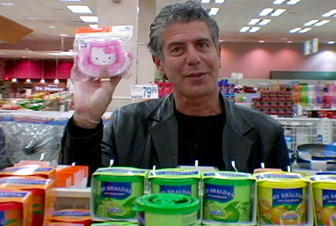 I heard that Anthony Bourdain, my hero, was planning to shoot an episode of “No Reservations” (Travel Channel) in Korea. He just posted that he has just returned from Korea. And I didn’t get to meet him. Okay, proud Koreans: I just got back from shooting an episode there. I had a fantastic time, developed a deep and abiding love for kimchee, Korean street food and your kooky-krazy party-all-the-time attitude. It was–however, truly dismaying to find out that just about ANY 98 pound Korean girl can drink me under the table. That soju packs a punch! And next year’s “clip show” of outttakes will have some priceless moments: The entire crew–swacked on soju and beer, singing “Anarchy In The UK” in a karaoke room. I will, of course, make sure that my own atonal contributions will be skillfully edited out.